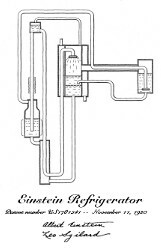 Design schematic of Einstein's Refrigerator used for the patent. When most people think of Albert Einstein, refrigerators may not be the first thing to come to mind. (There was that whole theory of relativity thing.) But Einstein did in fact design a type of refrigerator. Itâ€™s a variant on the absorption refrigerator design, based on the one created by Baltzar von Platen and Carl Munters. In the mid-1920s, there were frequent reports of family dying from leaks of toxic fumes from refrigerants of the time. Hoping to find a safer solution, Einstein teamed up with a former student of his, LeÃ³ SzilÃ¡rd, and went to work. By 1936, the two had acquired 45 different patents for three separate models of the design. Itâ€™s rumored that most of the designing efforts came from SzilÃ¡rd, with Einstein assisting him as a consultant. The thought being that Einsteinâ€™s role was more centered on getting the designs properly patented and adding credibility to the project. It worked, since their patents were swiftly bought up by Electrolux. However, with the advent of Freon, it did not last long in commercial production. Named simply the "Einstein Refrigerator", itâ€™s been heralded for being a quiet, inexpensive alternative for refrigeration. However, resources of the time made the Einstein Refrigerator too inefficient for everyday needs. Fortunately, modern day engineers like Malcolm McCulloch are looking into ways of applying currently available resources to improve Einsteinâ€™s design to meet demand. McCulloch expects that by altering what types of gasses are used, he can reach four times the performance efficiency of Einsteinâ€™s model.